1. What Labels, Stickers Stocks are available? We offer 2 different stocks: - White = White BOPP (Biaxially Oriented Polypropylene) White BOPP is made of Glossy White Polypropylene with a permanent adhesive that sticks well to a variety of surfaces. While BOPP is oil and water resistant but we only recommended it for indoor use. - Clear = Clear BOPP Clear BOPP is made of Glossy Clear Polypropylene with a permanent adhesive that sticks well to a variety of surfaces. BOPP is oil and water resistant but we only recommended it for indoor use. We offer white ink as a 5th color on these. Please see our FAQ section for details on how to set up your order prior to uploading. 2. What's the core size and outer diameter? All or our Roll Labels have a 3" Core and an outer diameter of up to 5"
3. What shapes are offered? Are custom shapes available? Our Roll Labels / Stickers come in the following shapes: Oval, Circle, Square (Round Corners Standard) and Rectangle (Round Corners standard). Custom shapes are currently not available. 4. Will my dispenser work with your Roll Labels? All of our Roll Labels have a 3" core and an outer diameter of up to 5" This will fit most hand-applied dispensers -- please check the specification of the dispenser prior to purchase if you'll be using our Roll Labels with any other dispenser. 5. Will the print quality of my Roll Labels be comparable to that of Offset? Our Roll Labels are very high quality but the print may not be as sharp as it is with Offset -- You may lose some quality, particularly with images. Try to keep all images above 300 dpi. 6. What does the Unwind Direction refer to? The Unwind Direction is simply the direction in which a label unwinds from a roll. 7. How do I set up my Roll Label File? 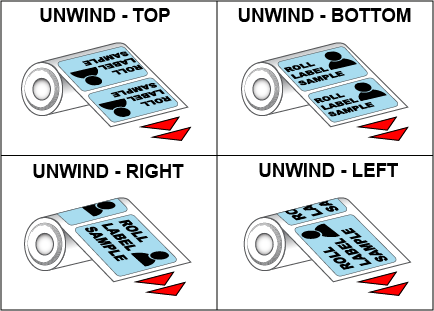 First, please download our Roll Label Templates. Bleed and safety line measurements are different than other products so we recommend you use them. Total bleed is .1875 out from the cut line and total safety is .1875 inside the cut line. 8. How do I set up and create a clear Roll Label with white ink? 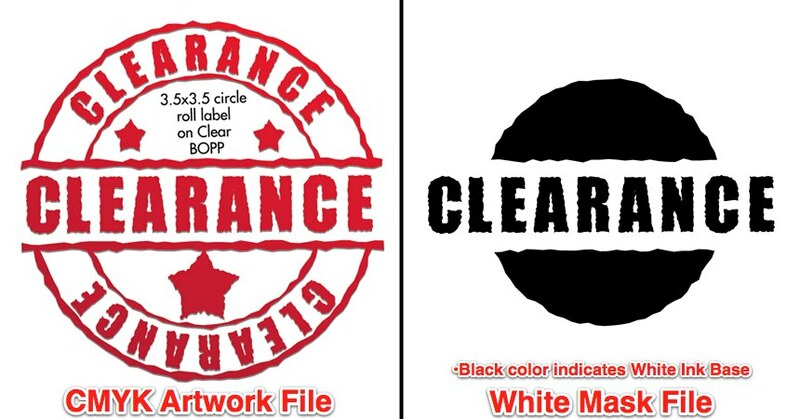 With Clear Labels, you have the option to use white ink as your base color so your prints can be opaque in some areas and transparent in others. Similar to Spot UV masks, White Mask files are separate from your artwork files and Black color indicates where the white ink will print. Make sure to create your mask file the same size as your color art file. This will prevent alignment issues during printing. Note: White Masks must be made in vector form as shapes and be saved as EPS or PDF. Use vector paths/shapes to create black color areas that will indicate where the white ink base will go. The rest of the area will represent the transparent label stock. 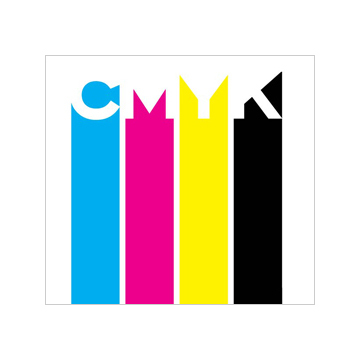 • White ink base will be printed to any color that’s in your Artwork Layer. 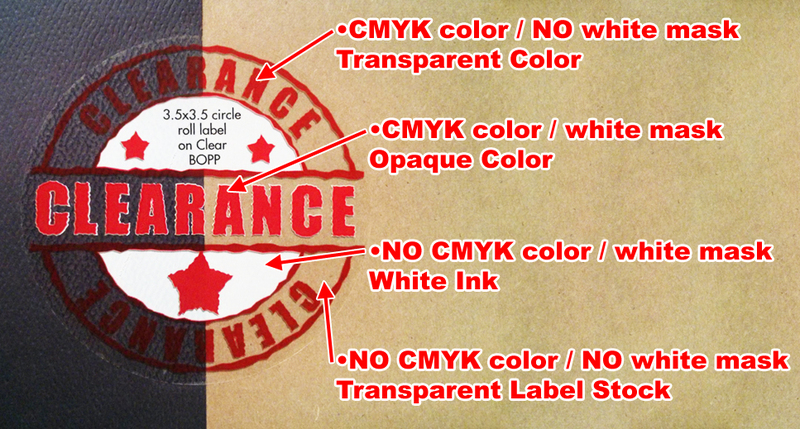 • Areas with color but without a White Mask will be printed as transparent color. • Areas with color and a White Mask will be printed as opaque color. • Areas with a White Mask and no color will be printed as white.